Here's an interesting story: when Apple officially announced the iPhone 4, they said they would release it in 8 countries first. Then, starting from July, it would be available in 18 more countries. These countries are Australia, Austria, Belgium, Canada, Denmark, Finland, Hong Kong, Ireland, Italy, Luxembourg, Netherlands, Norway, New Zealand, Singapore, South Korea, Spain, Sweden and Switzerland. The problem is, after all the rumors and debates about the antenna issues, white iPhones availability and software fixes, Apple hasn't confirmed the release date - and we're all still wondering whether these countries will actually get the iPhone 4 in two weeks or not. Some say that Apple will recall the iPhone 4 and delay the release date for 18 countries to September, in order to provide them "fixed" units. Some say they're not working on fixed units, they're just prepping a software update other than 4.0.1 to resolve the antenna issues. Some European carriers like Movistar already said they'll get the iPhone in July no matter what. It's a mess - carriers release statements without knowing Apple's next move and then say they're "just hoping" for that release date. But here's the thing: today's Apple special conference day. And as you can guess, it's a pretty important event. You can't come up with new statements on a conference day unless you really know what you're really talking about. That's what Danish Telenor did this morning. 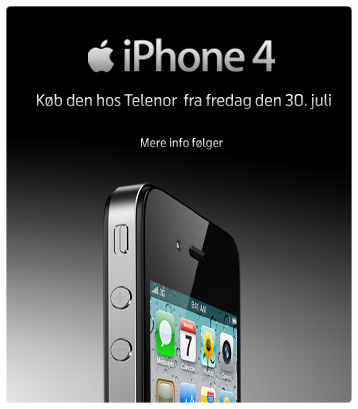 They put a nice banner on their website this morning saying that starting from Friday, July 30 you'll be able to get the iPhone 4 in Denmark. With Telenor. That's it, no hidden meanings or anything. With a further press release, they confirmed that 10.000 of Telenor customers have already signed up for the offer and that the iPhone 4 is the most interesting product they've ever had. Now the question is: are we sure Telenor knows the release date, or are they just playing the same game of other carriers? It could be, but something curious is in here: why announce a release date on the same day that Apple is holding a conference? Clearly you must know something. Anyway, Steve Jobs will (perhaps) tell us the whole truth in 4 hours. The wait for 18 more countries is almost over.